What is the object of this post-graduate Programme? What sort of candidates does the Programme target to? The Programme targets to candidates who have recently graduated and wish to expand their knowledge to a post-graduate level, as well as to business emploees and executives who wish to specialize in the fields of Strategic Management, Financial Management and Marketing. Moreover, it is designed in a way that can be attended by students whose background is not in the cognitive object of Business Administration or Economics but wish to educate themselves on that field. Promotion of knowledge and research on the cognitive objects of Business Administration, emphasizing on the sections of Strategic Management, Financial Management and Marketing. Offer of advanced knowledge for the development of specialized scientists and executives, able to staff all kinds of businesses and organizations of the public and private sector. Preparation of specialized and skillful executives who will contribute to the boost of greek and global economy. Preparation of specialized and skillful executives who will be familiar with the modern trends of Business Administration, in accordance with all aspects of modern technology. Why should I choose this MSc? 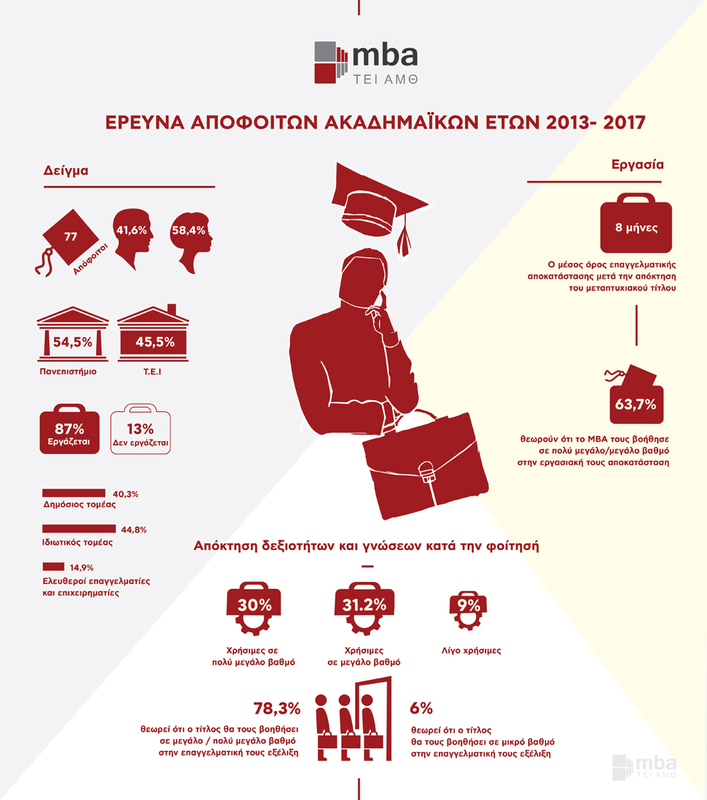 Graduates of the Programme are presented with career opportunities in greek and foreign businesses and organizations, because the title of MBA is concerned as one of the most fundamental master titles for any business executive. The Programme’s graduates are also required because of the expertise they will obtain by their choice of the stream of Strategic Management, Financial Management or Marketing. The Programme has been designed in order to be attended in one academic year (full time) or alternatively in two academic years (part time). The Programme accepts graduates of greek or foreign Universities. Candidates’ evaluation is based on the documents that he/she submits, as well as on an interview process. Occupation of an adequate grade of the bachelor degree. Familiarity with the use of computers. Satisfactory level of knowledge of the english language (FCE or higher), as a great part of studying requires the use of foreign literature. Will and commitment of the candidate to complete the Programme successfully. 6 compulsory courses and 6 courses of the stream they will choose. Every course is assigned with 5 ECTS units and every student needs to gather 30 ECTS units/semester in the case of full time attendance, or 15 ECTS units/semester in the case of part time attendance. Upon successful accomplishment of the courses, the student needs to undertake his/her Master Thesis, in a relative topic of the chosen study stream. Master Thesis is assigned to 30 ECTS units. To obtain the MSc title, 90 ECTS units are required in total. Attendance to all courses is compulsory. Main tution language is greek. English is also used in terms of bibliographic and literature research. The Programmes’ teaching staff consist of specialized professors, with extensive research, professional and educational experience. Students have the abilitity of personal communication with all tutors, for support in any academic issue. Also special lectures are conducted by many entrepreneurs and business executives, who are invited by the Programme.